So we have the awesome Peanut Butter Passion, the Pretzel Brulee, the respectable Strawberries N' Cream Cheesecake, and now we're going to try the one that has the coolest name: Cherry Chocolate Amoré! I'm not sure exactly what it is, but this one looks awesome. 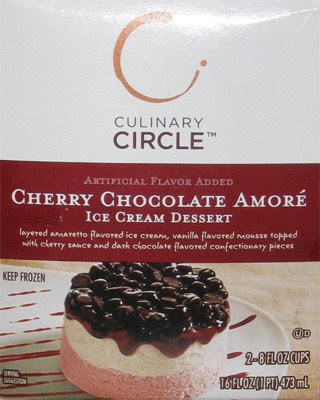 Cherry Chocolate Amore is "layered amaretto flavored ice cream, vanilla flavored mousse topped cherry sauce and dark chocolate flavored confectionery pieces". Ok, I don't know what amaretto is suppose to taste like, but still, it sounds awesome. Oh, did I mention it was only 5 A.M. when I cracked open the box? 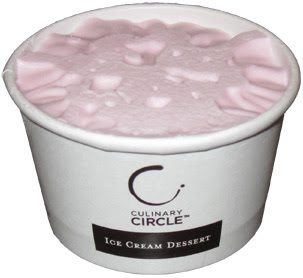 The ice cream layer is very pink and the only thing I smell is a very mild scent of cherries. I had a little trouble getting the shot since the bits on top are very dark. There was a little cherry sauce stuck to the cover so I gave it a quick test and it's good, reminds me of a nice cherry pie filling. To be honest, this shot just doesn't do it justice. Oh yeah, that's much better. 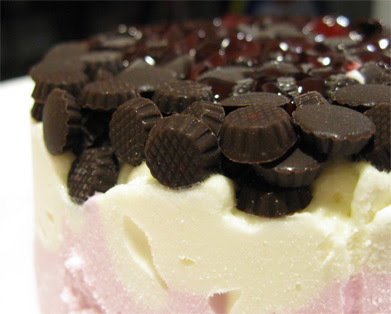 The pink amaretto ice cream looks less shocking now, plus you get the idea of how plentiful that top layer of dark chocolate bits is. Notice how the cherry sauce has come through the top a bit. The sauce is definitely more fluid than on the cheesecake dessert, and it did actually start to run a little as the dessert heated up. How does it taste? Excellent! It tastes like a top notch, fancy smancy dessert, and I mean that in a totally sincere, nice way. This is not something you serve your kids, this is something you share with your special someone after a nice meal. 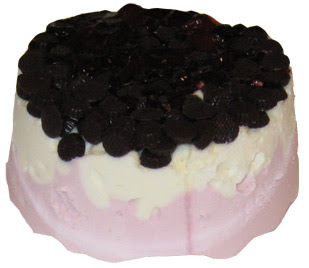 This one is all about a smooth chocolate and cherry combo. It's strong, but not overpowering, and not tart either. I appreciate the sauce texture as well, it's just the right consistancy to mix and coat the chocolate bits. I tried the amaretto ice cream by itself by it's very mild. I think it's purpose is only to accentuate the other flavors. Texture and creaminess are right on the money yet again. Everything is clicking together. Great job. 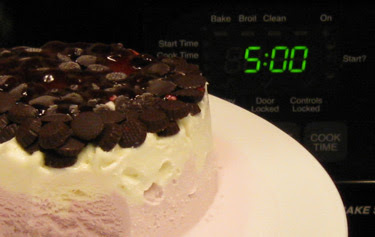 ...and no, I wasn't joking that it was 5 A.M.
On Second Scoop: I tried this again and I want to call this one the "fanciest" of all the ice cream desserts. It's just a really potent treat who's smoothness can't be denied. Break out the candlelight and share these with a loved one after a nice meal sometime.